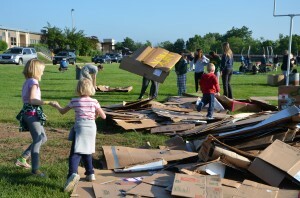 Box City | Family Promise of Hunterdon County, Inc. Box City – Family Promise of Hunterdon County, Inc. 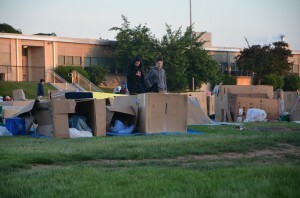 Spend the night sleeping outside in a cardboard box (that you bring with you) to raise funds to support Family Promise of Hunterdon County’s homeless families, and to increase awareness about homelessness in our own community. Everyone is welcome to participate by sleeping out, coming for the evening’s festivities until 11pm, or supporting those that do. We encourage participants of all ages! We welcome youth groups, sports teams, service groups, and families. Don’t forget to get a box for yourself! We recommend looking for a box at: appliance retailers, outdoor furniture stores, car repair companies, etc..
Click here to register, create your own donor page and start raising funds to support your community! Participants will raise a minimum of $30.00 each, and any participant who raises more than $50.00 will receive a special Box City prize. We would love it if everyone would have a goal of raising $100.00 each to help us help our neighbors in need. We’ll have great prizes for the top individual and team fundraisers (avg. amount raised per team member). Funds raised will help prevent homelessness and provide critically important services and housing for homeless families in Hunterdon. 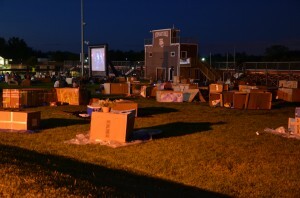 Weather permitting, we’ll have an outdoor movie & entertainment. By all means, bring games, balls, musical instruments, etc.. We’ll provide dinner, as well as a light breakfast and plenty of beverages. There are indoor restrooms on site, and the area is very safe. For those that don’t want to spend the night, we still welcome your participation! Join us for dinner and a movie and leave by 11pm. If you have questions about the event, please contact Joanne at joanne@familypromisehc.org. 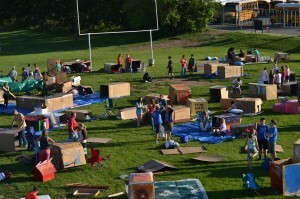 Want to see what Box City looks like? Check out this video with photos of prior years events. Thanks for supporting the important work of Family Promise!